An oral yeast infection (aka thrush or candidiasis) most commonly appears as white cottage cheese-like plaques on any surface inside the mouth. Less commonly, it may appear as red irritated areas inside the mouth. This red form is often present on the tissues of the mouth that are covered by a denture or other prosthetic appliance. An individual with a yeast infection may complain of pain or burning in the mouth or a change in taste sensation. However, many patients have no symptoms at all. Oral yeast infection ‐ Multiple white “cottage cheese‐like” plaques surrounded by areas of redness. Oral yeast infection ‐ Red irritated areas affecting tissues normally covered by a removable partial denture. Q: Is the condition contagious? Did I catch it somehow? Can I give it to anyone else? A: The truth is that many people have yeast in their mouth, but it seldom overgrows to such an extent that it becomes visually apparent or produces symptoms. Yeast can be passed from one individual to another, but this is not a clinical problem unless there is some other factor at work that allows the yeast to overgrow and cause an infection. Q: What causes a yeast infection? A: In most individuals, the yeast organism (Candida albicans) is a normal part of the many microorganisms that harmoniously reside in the oral cavity. 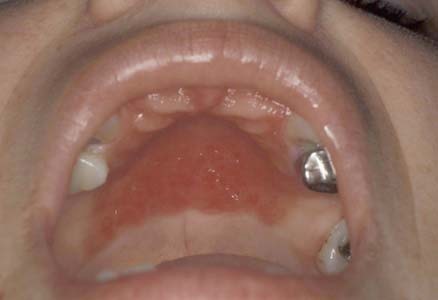 Infection typically occurs when the normal oral environment is disturbed or altered in such a way as to promote increased yeast growth (see patients at increased risk above). Q: How can a yeast infection occur under my denture? A: The area underneath the denture is a warm, dark, and moist place—a perfect incubator for yeast! Also, if the denture is always covering the roof of the mouth, the tissues are not cleaned of any yeast that may build up during the day. Dentures should always be removed and properly disinfected overnight. Q: How can my dentist treat a yeast infection? A: Most importantly, your dentist will evaluate you to determine the underlying cause or causes of the infection. Once this is accomplished, your dentist can tailor a treatment plan to best manage the infection. In some cases, attention to improving denture hygiene is all that is necessary. When necessary, medications (antifungals) are prescribed to stop the yeast from growing. These range from topical rinses and lozenges to pills taken by mouth. Finally, when the underlying cause is beyond the scope of dentistry, a medical consultation may be warranted.